Our focus at the Bell Sports Medicine Institute is to keep active people active. We take care of a wide range of patients, from professional athletes to weekend warriors, from teens to seniors. We also see patients with injuries in the workplace. If your injury is slowing down your exercising, sports, or workday, we have the latest techniques to get you back in your game. We are here to get you back to your pursuit of good health, fitness and athletic achievement. Your experience with us will benefit you and those affected by your injury: including your family, your team, your employer, and those who depend on you and care about you. Our goal is to provide the latest in state-of-the-art care, and to exceed your expectations in service of your health and activity. 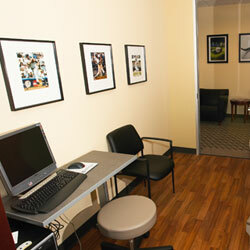 ​Our comfortable and friendly facility is set up for efficient care and a quality experience for every patient. This gives you the best chance to get back on the field or to work quickly. Using the latest diagnostic methods, we will give you a complete and thorough evaluation to find the source of your injury or problem. Our comfortable and friendly facility is set up for efficient care and a quality experience for every patient. We commonly arrange x-rays to be taken of the injured area, and we arrange MRI scans to help diagnose the injury. Then we will make the most effective and efficient treatment plan that is specific to your problem with the latest techniques. This gives you the best chance to get back on the field or to work quickly. Dr. Bell is a specialist in minimally-invasive arthroscopic surgery. Arthroscopy uses a small camera to see inside the joint and better treat the injured area. Surgical incisions are smaller and there is minimal trauma to the surrounding tissues. This means less pain, better results and a faster recovery. ​Click to view all the surgical procedures we specialize in, to see information about all the operations we perform on a regular basis. We also offer specialized office-based treatments and injections, such as Hyaluronate lubricant injections (Supartz, Synvisc) and Platelet-Rich Plasma autologous (from your own bloodstream) injections. ﻿We stock braces and supports for all types of injuries. When you see us for your injury, we can place some of the best orthopaedic splints and braces to treat your injury. Rehabilitation is the key to healing of every orthopaedic injury. At Bell Sports Medicine we have our own physical therapy clinic on-site, to allow instant collaboration and coordination with Dr. Bell. We do have relationships with many of the excellent physical therapy clinics all over Northern California, If you live or work locally we'd be glad to have you receive your physical therapy with our experienced therapist, Mark Snyder PT. When you step into our office, you will immediately be able to tell that you will be having a unique and comfortable orthopaedic experience with us. Our facility has used the most innovative ideas in medical office design to give our patients the most efficient and relaxing time with us. Outside the exam rooms we have comfortable chairs in your own “warm-up” area. We have flat-panel monitors to play ESPN and all your sports movie favorites- from "Rudy” and “The Blindside” to Greatest Sports Bloopers. 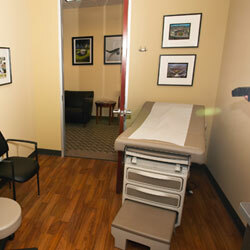 Each of our examination rooms is very private and comfortable. Each has a special sports theme, and we even change the sports theme according to each season. Each examination room has a computer so we can refer to our electronic medical record system. And if you undergo physical therapy at our facility, we hope your enjoy the views of the nearby trees and Pleasanton Ridge. You can feel secure since we utilize an Electronic Medical Record System for accurate and secure medical records at our fingertips. Referring physicians receive a detailed plan of recommendations for treatment. We want to make your experience at your visit match the high level of up-to-date orthopaedic care you will be receiving. 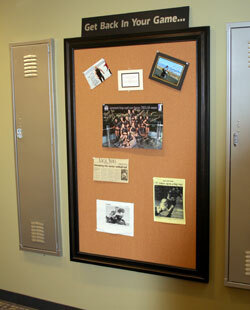 ​If you bring us a picture of you back to your active, healthy lifestyle, we’ll put you up on our Patient Wall of Fame in the office! ​We are blessed to be located in the great East Bay family town of Pleasanton. Pleasanton values sports and fitness for kids and adults of all ages. Dr. Bell is committed to these goals by coaching in several leagues and providing event coverage and injury prevention presentations to teams. We sponsor several leagues and programs such as Pleasanton Little League, BUSC Soccer Club, the International Christian Cycling Club, and PPIE Pleasanton Partnerships in Education.